This year, being the 100th Anniversary of World War One, the SAA decided to mark the occasion by holding a Paint a Poppy Challenge. Partnered with the Royal British Legion, it is a way to say “thank you” to those courageous men and women who served and sacrificed for our country and freedom. The idea is to gather as many poppy paintings and drawings as possible together to create a unique art exhibition to be held later this year at their headquarters in Nottingham, as well as raising funds for the work the Royal British Legion does, by monetary donations from those taking part in the challenge. The challenge was open to everyone, in any medium on any paper as long as it measured exactly 125x125mm (4.9×4.9 inches). As well as individuals, SAA art groups were able to send in group entries. 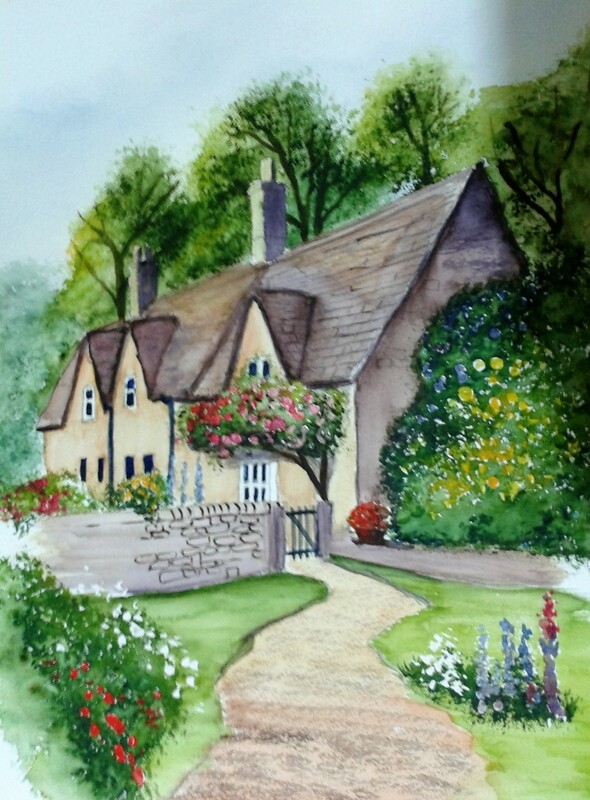 Being a member of SAA Frome Valley Art, based in Winterbourne, South Gloucestershire, I decided to take part. I love a challenge, and this was undoubtedly one. As much as I enjoy painting detail, producing a small painting is a lot harder than one imagines. First, was deciding precisely the image I wanted to create. I wanted something different from the usual poppy flower scene, one that not only reflected the simple beauty of the flower, but also the immense emotion evoked by this memorial event. 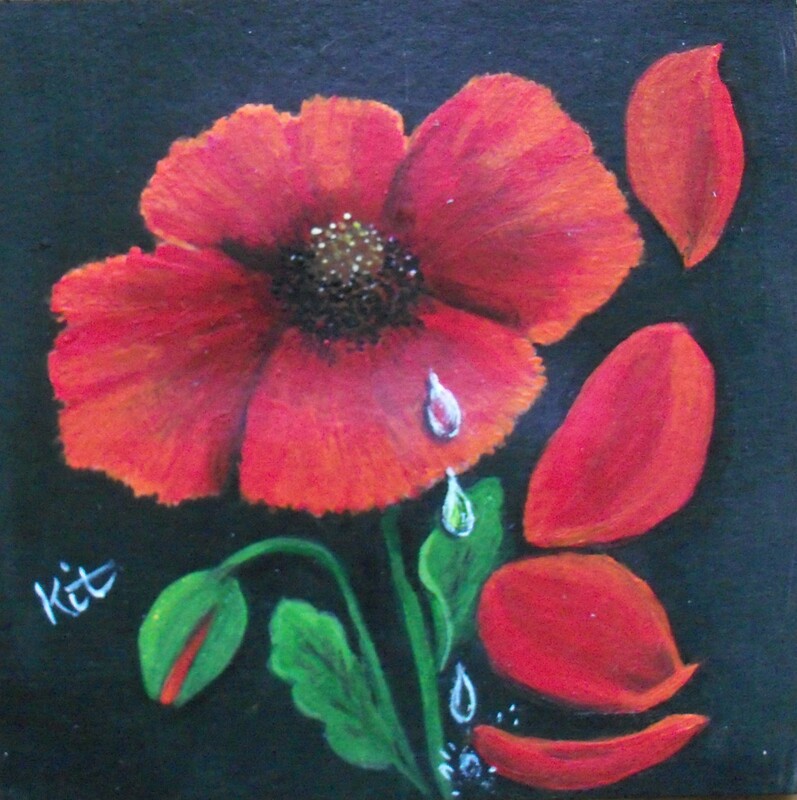 I’ve painted several poppy pictures in the past and wanted something different, one that had meaning. I thought long and hard, and unusually for me, painted many draft pictures until finally deciding on the one that for me, worked. First, a black background – to represent death and mourning as per the black-bordered telegrams families of those fallen often received. Also, using a black background accentuates the flower’s vibrancy, popping it out of the image. It called for a poppy in bud to represent the young age many of our soldiers were when called up to arms during conflict, some as young as sixteen. I wanted a poppy in full flower, representing parents and families of those left behind, and I wanted falling petals, to represent those fallen in battle, a reflection too of the millions of petals dropped in various war memorial services, in mind particularly those dropped at the Remembrance service at Royal Albert Hall, London. Lastly, and for me the most important part, I wanted to add falling teardrops from the adult flower: tears for a son, husband, brother, uncle, grandfather who never came home. After many weeks, my challenge attempt resulted in “Tears for the Fallen”. It’s doubtful I will be able to get to the exhibition although it will be available online at a later date (I’ll keep you advised). In Nover 2018, I was delighted and honoured to have this painting and its story featured on “Yesterday Uncovered” blogspot. Thank you, Pauline Barclay. During the past couple of years I’ve taken to entering art competitions, both small, online and national. Needless to say, I’ve got nowhere so far. This can, at times, be soul destroying and disheartening, especially when you see the type of work that has won or achieved a placing or merited recognition. I sometimes feel if I paint something “crap” it might get somewhere instead of the “chocolate box” images I prefer to paint but that would be doing myself a disservice. I’ve learned art is a lot like writing, both the artist and the author has to be thick-skinned. Some people love your work, others don’t. That’s life, and thank goodness we don’t all have the same tastes. Not to be a person who gives up, I recently took part in an art challenge, organised by an international art group I am a member of. 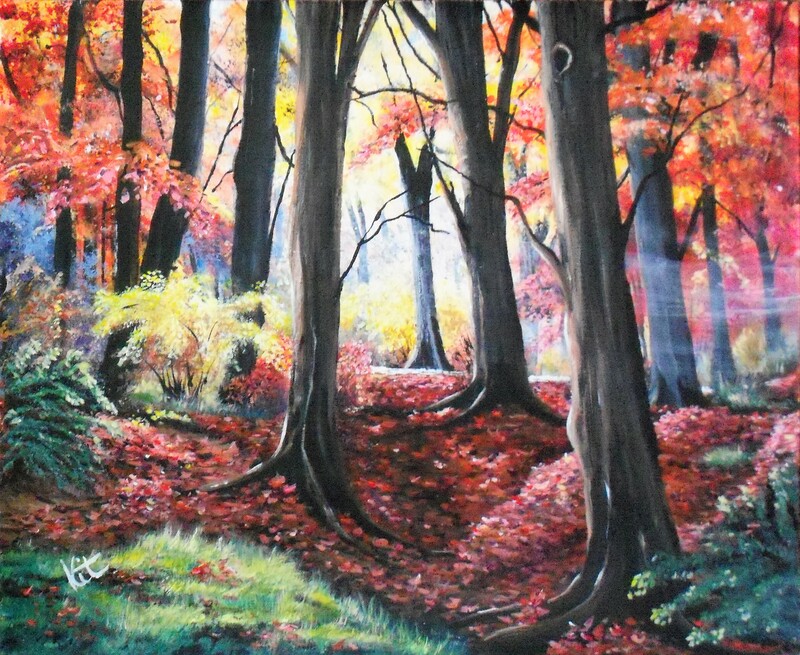 The subject matter was an autumnal forest scene for us to interpret in our own style and medium. And… my painting was given … First Place. Wow! Now that really boosted the spirit. Hope you like it as much as those who voted for it. The past year has gone by in a flash; I can’t believe it is twelve months since I took a giant leap and joined Frome Valley Art, affiliated to the Society for All Artists, of which I have been a member for some years. I was nervous of joining, worried my work wasn’t up to the group’s high standard. For months I felt very much the new girl in school. It was only during the last two months I finally felt at ease, and often called upon for advice and help to my fellow painters. The group is friendly, always helping each other, and we have a lot of fun and laughs. There is no a formal tutor, we paint our own thing in our own style, in any medium we wish. 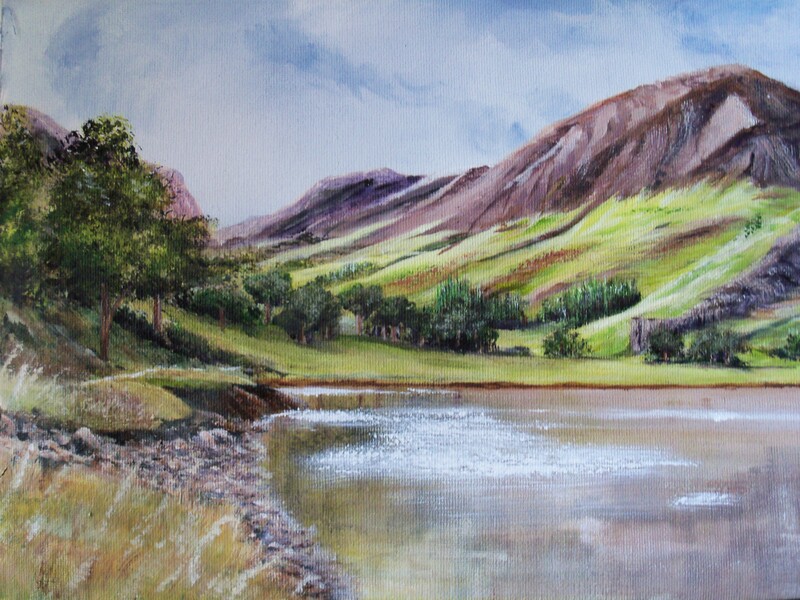 Occasionally we have workshops or demonstrations, either given by one of our more experienced members or by invitation to well-known professional artists, this year’s included Keith Hornblower and Arnold Lowry. Those past few months have also included the lead up to the group’s 23rd Annual Art Exhibition. There were many decisions to make, such as what pieces to show bearing in mind only five could be submitted. Could I get this current one finished in time? Would I be able to find the right frame or correct mount for it? What price do I put on each? Will I be disappointed if nothing sells? With nearly 200 framed exhibits along with almost 100 unframed but mounted artwork submitted, and with such an amazing about of talent producing excellent of work, the likelihood of returning home with the same number of pieces as delivered before the show, was high. The Exhibition took place over the weekend of 12th and 13th May 2018, this being my first public exhibition. Having only had one small private exhibition before, I did not know what to expect. Finally it was time to deliver the paintings, where the stewards checked they were suitable for hanging, matched the details previously submitted, the correct catalogue number stuck on and duly hung with their corresponding labels: title, artist, medium, price. Not all were for sale, there were many green dots about. Prior to exhibition opening was a Preview Evening where fellow members and guests could come and see the works as we enjoyed a glass of wine or two while we looked, admired and commented and mingled between the many boards filling the venue. And a most enjoyable evening it was too. It was also an opportunity to meet other members of the group we rarely see. A chance to put faces to names. Frome Valley Art runs an afternoon and evening session every Friday, it is only at demonstrations we get together, when there is little time for socialising and, even then, not everyone is able to come. It was also fun watching everyone’s reaction to the various pieces on show. Wondering what people were saying as they stood in front of mine. Were they discussing them? Did they admire them? Dislike them? So, preview evening over. Followed by two days of nail biting. Two days of wondering… before it was time to collect our paintings after the exhibition had closed. I went to my board – saw an empty space, a lonely label. Had one of the stewards already begun taking down my pictures? Then it dawned on me: one of my works had sold – elation! It was one I had decided to show at the last minute. It was also the one I least expected to sell. And I am no longer a public exhibition virgin. That must count for something! My desire to paint has been spurred and encouraged over the years by several artists, going back in time to watching Nancy Kominsky (remember her?) on TV, as well as Bob Ross among many others, but it’s only since I took up the paintbrush myself that I found contemporary role models in my medium. 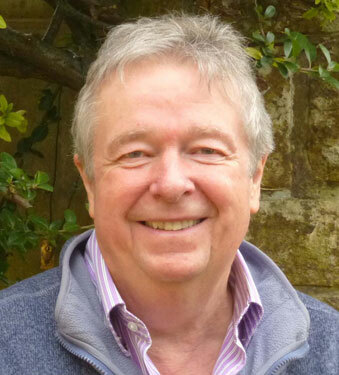 One in particular has been a great inspiration to me, and that is Terry Harrison – his easy, relaxed style, his subject matter and excellent tuition, both on TV and through his many books. So it was with a very heavy heart I learned last week of his untimely death after a very short illness. The news came as a shock, both to me and to everyone who knew him and his work. I had the pleasure of meeting him and participating in one of his workshops last October and I am so pleased that I did, that I had that opportunity to meet and be taught by him, it was a longstanding desire since I first started painting. He even gave me a lovely compliment on my earrings (little silver paint palettes). He had a soft, gentle voice, told lots of jokes and made for a relaxed atmosphere in which to work. Terry worked in both acrylics ( my medium) and watercolours. 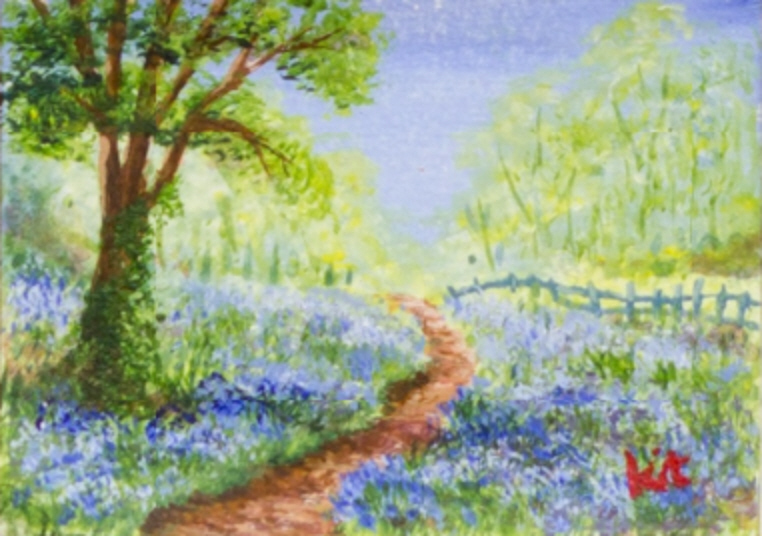 In fact, it was following one of his demonstrations on the SAA Channel that I first attempted to paint a “proper” picture, listening to his instruction as I painted bluebells from the next room. And what was even more exciting was that first painting sold! What I also loved about Terry was that he wasn’t precious over his paintings, and was only too happy for people to copy the subject matter. His tuition books invariably including tracings of his artwork for people to use. So, this is my way of saying goodbye to a fabulous artist and person. My thoughts are with his family at this sad time. I know Terry’s work and legacy will long remain. Goodbye, Terry, and thank you for all you have given me and the world. RIP. Occasionally, I like to step outside of my comfort zone with acrylics and try a different medium. Last time, it was with pastels, very enjoyable and rewarding but the dust pastels create and the stress on my arthritic hands proved too much for me to do more. I did try a few pieces at home but none were successful. This time, I ventured into the watercolour pot. I’d used watercolours before, years ago, back in school, and when I first found my muse a few years ago on a writing weekend but again, not at all satisfying. However, thinking that now I know more about the techniques of painting and colour mixing, decided I could participate in this workshop for the sheer fun of it. Plus it was a good excuse to wear my new earrings! Thus, a few weeks ago, my favourite contemporary artist, and one whose work has inspired me the most, Terry Harrison, was holding a watercolour workshop in my locality. It was both an opportunity to meet this lovely man in person and learn even more from his talented hands. 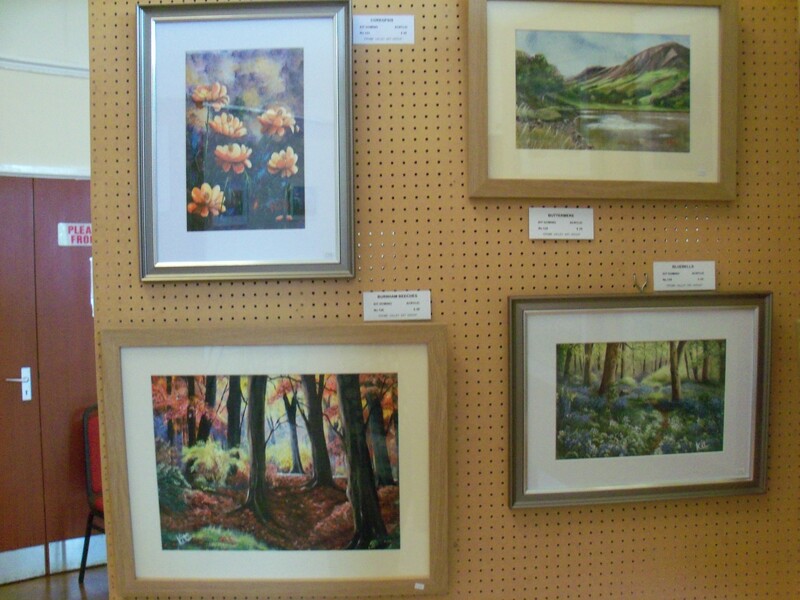 Terry works in both watercolours and acrylics, and much from one medium is relevant to the other. And for the first time I strode confidently into the hall and took my place at the front, rather than at the back, as I was wont to do a few years back. The first part of the morning was given to Terry to paint the picture from scratch through to completion, explaining how, mixing what colours, what brushes to use and order to apply the paint (most important in watercolour, as the light must be done before the dark, unlike in acrylics when it doesn’t matter and anything goes! ), and how to solve problems like too much water, masking, plus many techniques and tips. 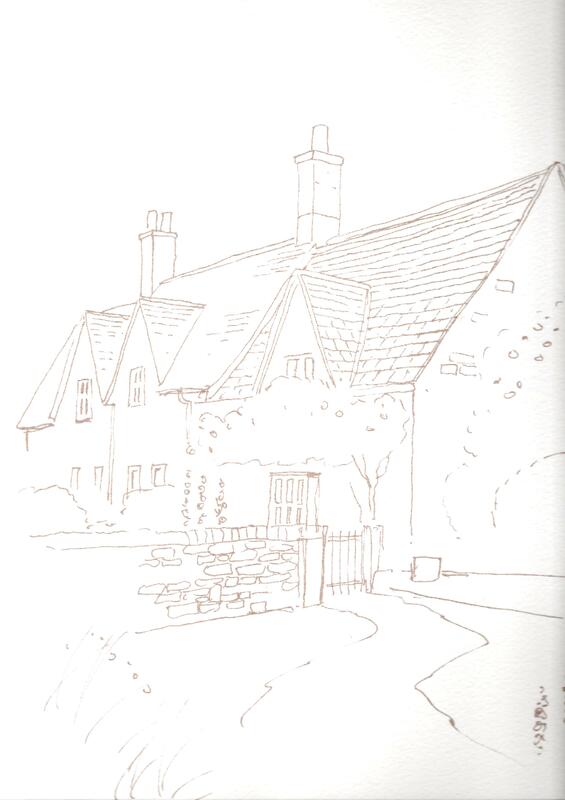 We were all painting the same subject, a Cotswold cottage and garden, drawn by Terry from a photograph. He’d reproduced the simple line drawing on art paper ready for us; it was up to us to turn it into a masterpiece. Well, that was the theory…. Terry is an excellent, patient teacher, very amusing as well as knowledgeable and passionate about his art. His advice and guidance and interception when mine went a bit wrong, was invaluable. Although we all painted the same image, everyone’s final picture was different, and I think I can safely say everyone enjoyed themselves. It was a fun day and I learned a lot but it seemed far too quickly we were all finished and our day was over. Extra copies of the outline drawing were available so I purchased one to take home and try again. Already my thoughts were racing away as to what I could do. And I did. I scanned the image and produced another picture, this time turning the summer scene into winter. I used acrylics as I think I would have needed a gallon of masking fluid to keep the white paper white for the snow. So, would I use watercolours again? Yes, definitely, particularly as I like to go away to hot places and acrylics are difficult to work with in the heat. And also as practice pieces for my acrylic studies. And as I have a box of watercolours lurking in my paint store, I have no excuses. Thank you again, Terry. On rare occasions, I am so moved by a photograph I simply cannot rest until I have painted that image. This happened back at the beginning of 2015 when, trawling the Internet for inspiration, I stumbled across the work of Rosanna Castrini, a professional landscape and garden designer, botanist, writer and photographer who lives in near Turin in Italy. This beautiful lady’s photographs are simply stunning, imaginative, and blew me away. Therefore I was not surprised to learn that the photograph I had fallen in love with, “My Prairie Garden” had, in fact, won her the title 2014 International Garden Photographer of the Year. That photograph stayed with me to the extent I was moved to make contact with Rosanna to request her permission to use some of her images as reference photos for my paintings and in, particular, the award-winning photo. Rosanna agreed, saying she was honoured by the request. That was back in November 2015. Life and welcomed painting commissions intervened until last month, I was able to start work on the painting that had been sitting on my shoulder and in my heart, screaming to be unleashed. Progress was slow, the detail intricate; it was certainly a piece not to be rushed, and I enjoyed every brushstroke I put down on the 56cm x 46cm canvas. Yesterday, I signed the work as complete and promptly sent a photograph of it to Rosanna in Italy, wishing for her to see the painting before going public, hoping she wouldn’t be disappointed with my efforts. On the contrary, she was delighted with the result. 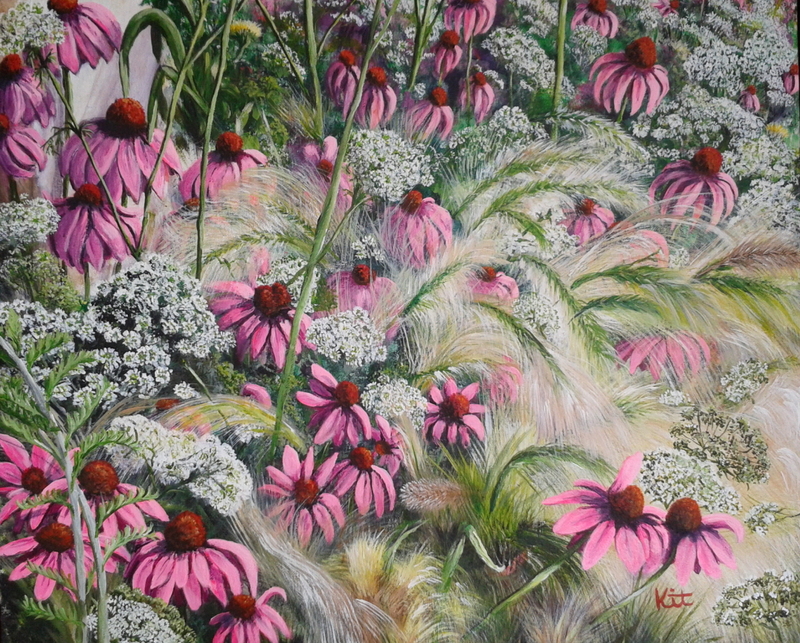 I am so thrilled and proud now to send “Rosanna’s Garden”, as I have entitled my interpretation, out into the wide world. I hope you like it too. 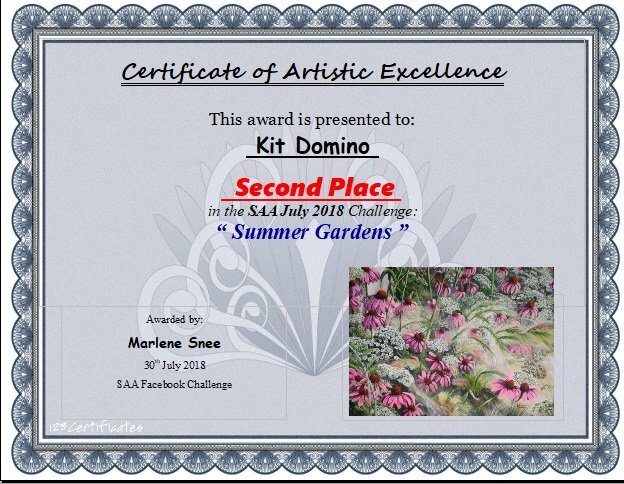 In July 2018, “Rosanna’s Garden” was awarded Second Place by the Society for All Artists, in their July Challenge. Back in late 2015, I took part in the World Record Challenge run by the Society of All Artists to create a display of the largest number of original works of art in one place. It was intended that entries would be mounted on a series of display boards, showcasing every card received. There was no prize involved. The challenge was open to all members of the SAA worldwide, professional or beginner, any art group, art tutor, family and friends, there was no age limit – anyone could take part. There were no rules other than the piece submitted had to be of trade card size 64mm x 89mm, (think business card size), on any theme and in any medium, and no limit on the number of pieces any one person could submit. Sounds easy, right? No. I wanted to be part of this unique display but what to paint? Something simple? Something abstract? Something totally off the wall? It took me ages to decide, especially as I’ve never done anything so small and as most of my work includes lots of detail so the subject matter was a hard one, let alone painting it. In the end, I decided to go with an image which basically sums up my work, and that for which I am well known for producing. Yes, you’ve guessed it! I painted a miniature bluebell scene. One card, one entry… and duly sent it off. I wish I had painted a few more as the exercise of creating such a tiny piece of work was indeed challenging, and good for me. I learned a lot. The submissions received amounted to over 32,000. Yes, that’s right: 32,283 to be precise. That’s 32,283 little cards to be mounted on what eventually became 70 boards holding around 480 miniature works of art, including mine. All the paintings can be viewed here: http://www.saa.co.uk/worldrecordgallery. I have to admit when I looked at each and every painting (not all in one sitting, I might add) I was amazed at the quality of work. You can find my little effort on Panel 22, Row 20, Column E And I have to say I felt I had not done as well as I could have. It is not my best piece and perhaps I should have painted the underwater scene with jelly fish and coral I originally had in mind to do but hey, it doesn’t matter. I’m there, I’m part of it, as are over 10,000 other artists. Oh, all right. If you really don’t want to pop over to the site and trawl the boards, here’s my little effort. Not much, I admit. And yes, I could do better (to quote my art teacher at school) but I don’t care. It was worth it to be part of this marvellous and unique event. The SAA has opened the exhibition to members to visit on special days; sadly I am unable to make the journey otherwise I would have loved to go up to Nottingham to see this spectacle. A lot of work has gone into this effort, both by the artists and the team at the SAA. I think it’s amazing and I thank them for giving all of us this opportunity to take part. I do hope it is run again with a view to breaking this record. Meanwhile, I’m working on what I can paint next time. Accepting a commission is a double-edge paintbrush. There’s the thrill of someone (a complete stranger) liking your work so much they want a special piece to hang in their home, whilst on the opposite side is the worry, the fear of letting that person down, being unable to come up to their expectation. Would they like it? Is it the sort of thing they wanted? Could I have done it better or differently? …all the angst of being an artist. With most of the commissions I’ve accepted, the subject matter has been left very much open, with requests such as “I want something that has lots of pink flowers?” or “Will you paint me a woodland scene full of autumnal reds and oranges?” being the more usual approach. 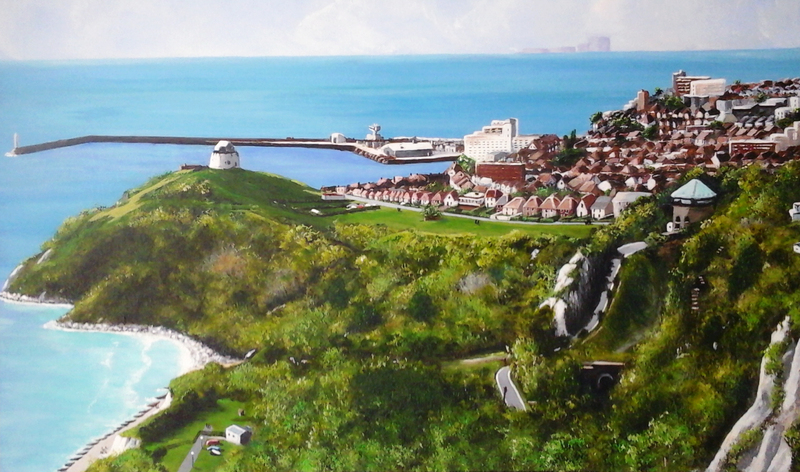 Thus, perhaps you can understand the challenge of painting something more specific after I was fortunate to secure a recent commission to paint a landscape from a photograph taken by a new client: a view across to Folkestone, England from an area I later found out was called the Warren. As I wasn’t familiar with this part of the country, I spent many hours on the Internet and Google Earth, studying various images of the region in order to familiarise myself with the location. However, it is difficult to get any feel for a place from a photograph – one needs to see, smell and feel the atmosphere of an area in order to bring it to life and do it justice – so I was very much working in the dark. There was also the dilemma of what to include and what to leave out, bearing in mind my client’s requirements, in order to create a more pleasing landscape. 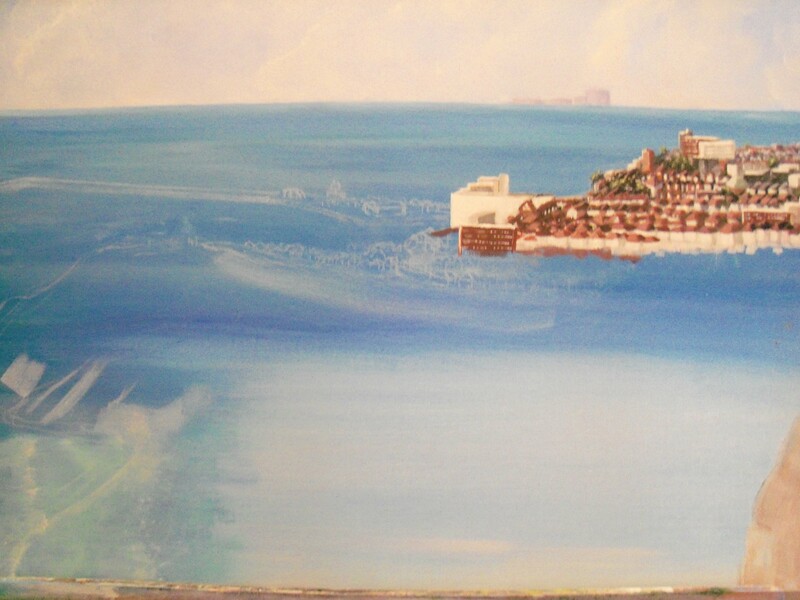 In this instance, I’d decided to omit many of the telegraph poles and wires that criss-cross the foreground and the tree bottom left, along with several communication masts on jetty near the hotel (the large white building just off-centre mid distance) – the artistic licence bit. There is also the quandary of how true to life one paints from a photograph: the lighting, the time of year, etc. The first step was to grid the photograph in order to transfer the image to an 60 x 40 cm (A2) box canvas, choosing a 10 x 6 grid. I find this easiest when including a lot of detail, particularly buildings. Using a soft pencil, I marked the canvas at its edges, then drew in the vertical grid. The ruler was not long enough to cover the width of the canvas so I resorted to using the edge of another same-sized canvas to draw along. The second horizontal line down was well placed as this provided the perfect horizon line approximately one-third the depth of the painting. This exercise was repeated on A4 canvas paper to help when deciding on the palette of each part, testing colours, and as a reminder of what goes where. Once happy with the sketch, I erased the grid lines, with the exception of the horizon line, which I masked off to provide a level edge to paint to. In the original photograph, the clouds are not well defined, being a wishy-washy one colour blue across the complete width. To give more life and depth to the sky, I painted in various banks of clouds sweeping in, without drawing too much attention to them. Although not clear in the supplied photograph, on the horizon to the right is Dungeoness Power Station. My client had requested specifically that this was to be included, so I painted in this, slightly larger than real life to make it more visible, before carefully removing the masking tape once the paint was completely dry. 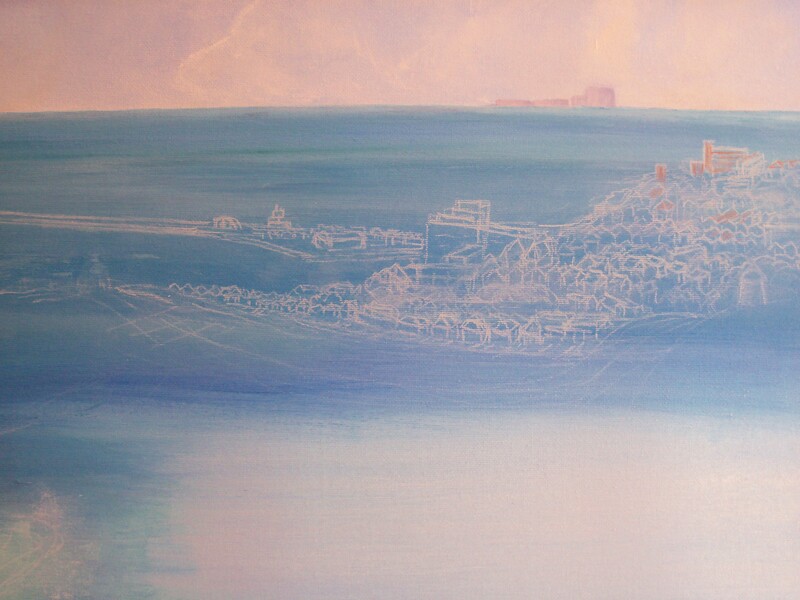 Another strip of tape was then place above the horizon line in order to paint in the sea – the English Channel. The picture was slowly built up, layer by layer, building by building, although not being a slave to the photograph and not including every single house or tree in mid distance. 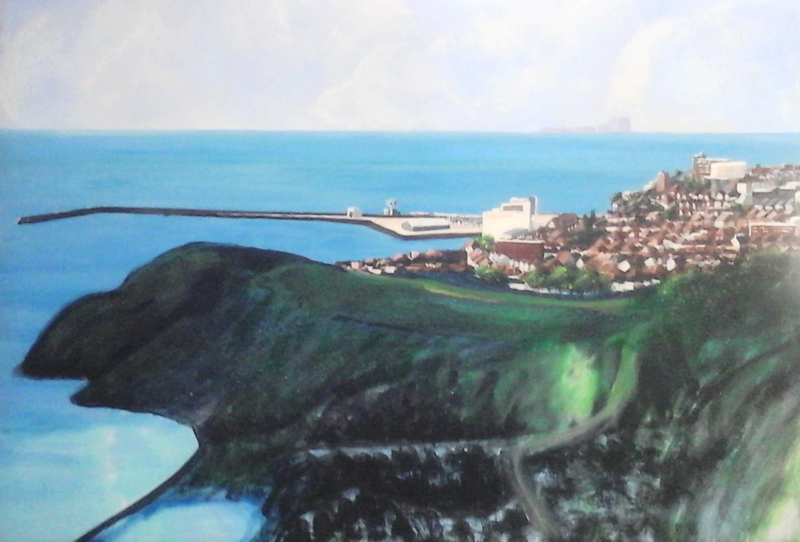 Slowly, each level was created, adding in the jetty and quay, before underpainting the green on the cliff top, along with the contours and outlines of the foreground. During this process,the top and bottom and side edges of the canvas were also painted, wrapping the scene around so that the canvas could be hung with or without a frame, depending on the owners’ preference. Next, the two martello towers, the lighthouse, the green with its parking area, cars and clubhouse, the trees and shrubbery down to the sea, the promenade and breakwater, and finally the campsite with its building, camper vans, fence, people and lampposts were added. Again, these were first drawn in using a pastel pencil until I was fully happy with their placements and size in relation to the surroundings before painting in, complete with shadows. The hardest part of any painting is knowing when to stop, when to stop fiddling, as one wrong stroke, one extra line can ruin the whole thing so before I reached that point, the painting was signed. Done! Duly finished the work was delivered to two very happy clients, who welcomed me into their lovely home, and discussed over coffee where they were going to hang the canvas, and where I also learned the background to their wanting this painting and what it meant for them. 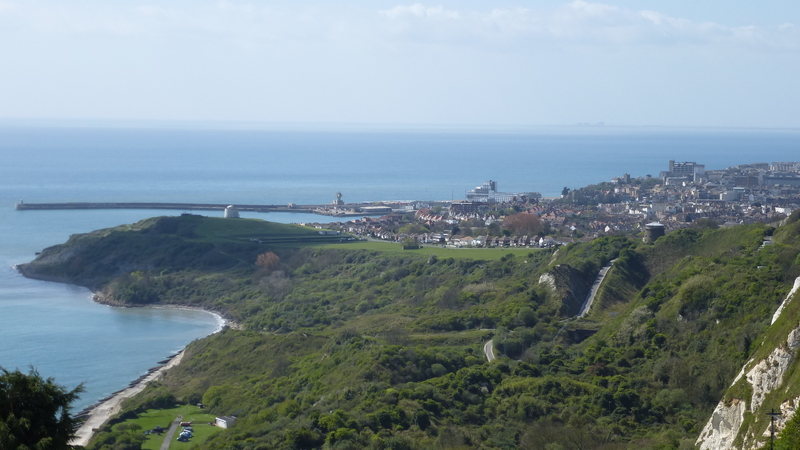 Whilst in Kent, I was also privileged to be given a guided tour around Folkestone, observing and learning about many of the buildings within the painting, and also taken up to the Warren, to the view point where the original photograph had been taken from, to experience for myself the whole panorama. Breathtaking, despite being a dull, blustery and drizzly October afternoon. up on the cliff top at the Warren, but I like to think I had captured the area well in my work, and I like to think my clients feel the same. 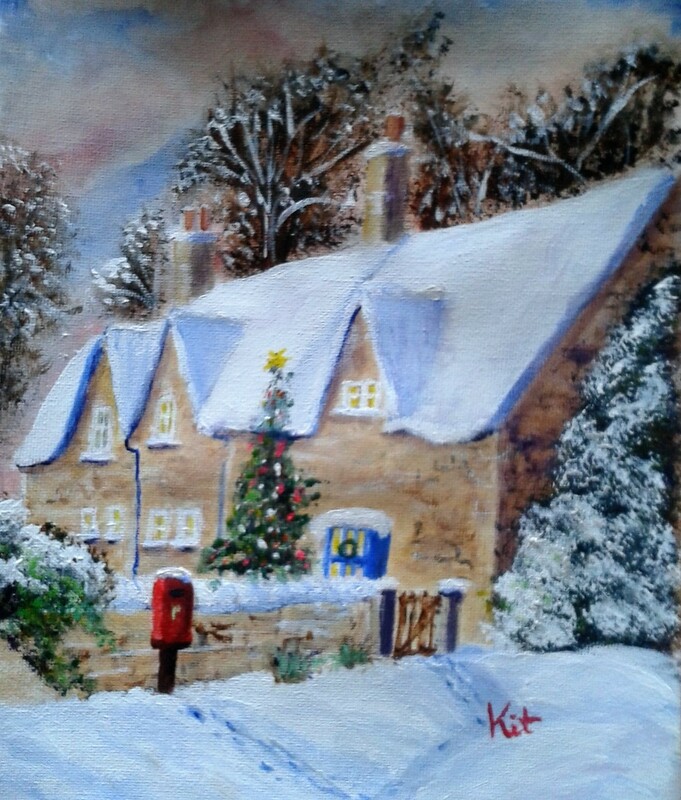 Thank you Dave and Marion for the opportunity, and to Anne and Alan for being my host and for introducing me to two new friends of Kit Domino Art. NOTE: All photographs and images have been used with kind permission from my client. Painting – I never knew I had it in me! Giving interviews is difficult as I find it hard to talk about myself, so I was thrilled with the result of this article published on Loveahappyending.com. recently. Do read if you get a moment. 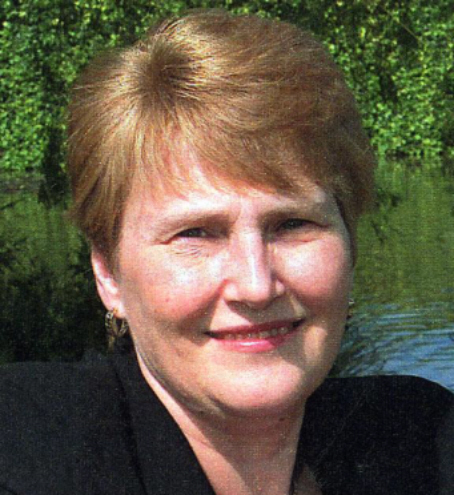 Thank you Linn B. Halton for a great job.